On microscopic examination of flesh for the detection of trichina. Edwards, John Baker, d. 1900. Journal : Canada Medical Journal and Monthly Record of Medical and Surgical Science. Vol. V.
Montreal : Dawson Brothers, 1869. London, Paris, New York : Balliere Brothers. Description : 481-484 p., 543-544 p., [2 l] pl. ; ill.: 10 phot. figs. ; 21 cm. Photographs : 2 mounted sepia collotypes — composites of photomicrographs and of drawings of the trichina worm. Photographer : J[ames] Inglis (1835-1904). Subject : Muscle — Trichiniasis (Diagnosis of). Author caption: By J. Baker Edwards, Ph. D., F. C. S., late Lecturer on Chemistry and Medical Jurisprudence at the Royal Infirmary School of Medicine, Liverpool, England. Continues as: Remarks on Trichinæ Photographs. Photo caption: Micro-photographs of trichina, from human muscle. Plate No. 2. Photographer's name etched in the negative of plate 1. Plate 1 reproduced in (1869) Canadian naturalist and quarterly journal of science. Montreal: Dawson Brothers ; vol 4, facing p. 326. The illustrations presented in this number are, with the exception of No. 5, photographs of Trichinae taken from the flesh of Dr. Bessey's patients, by Dr. Fenwick; to which reference was made in the last number of this journal, page 517. In 1869 an outbreak of fatal trichinosis led to a series of articles published by various authors in the Canada Medical Journal. Edwards was Lecturer on Chemistry and Toxicology at the Liverpool Royal Infirmary School of Medicine until 1866, at which time he emigrated to Montreal to join the medical faculty of Bishop's College as Professor of Chemistry and Microscopy. He is remembered today for his participation in the public discourse over William Fox Talbot's patent infringement lawsuit against Martin Laroche, writing two papers supporting Laroche 1, 2 which were published shortly after the end of the trial. 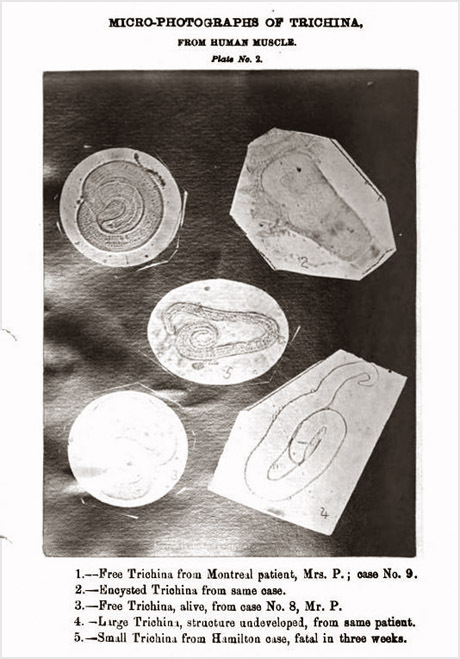 The name of Inglis is inscribed in the negative of the first plate, but given the fact that Edwards was an expert in the chemistry of photography there can be no doubt that he made the original photomicrographs that were then reproduced by Inglis. 1 Edwards, John Baker (February 19, 1855), On Photography: with special reference to the chemical principles involved in the collodion and paper processes. Journal: Proceedings of the Liverpool Literary No. XI. ; Liverpool: Printed for the members of the society; pp. 16-23. 2 Edwards, John Baker (March 10, 1855), Observations on the chemical points at issue in the trial Talbot v. Laroche. Journal: Liverpool Photographical Journal Vol 2. pp 40-42.